Protest outside Councilman Kalman Yeger's office in Borough Park. New York - Two days after ruffling feathers by calling into question the existence of Palestine, Councilman Kalman Yeger found himself the subject of conversation yet again today, with Mayor Bill de Blasio calling for an apology for what he termed “destructive” comments. The mayor called an Yeger to issue an immediate apology for his remarks. “People in public life should by about unifying people and finding ways to work together, what he is doing is the opposite,” said de Blasio. The mayor stopped short of calling on City Council Speaker Corey Johnson to remove Yeger from his position on the council’s immigration committee, but said that he believes that doing so would be the appropriate course of action at this time. 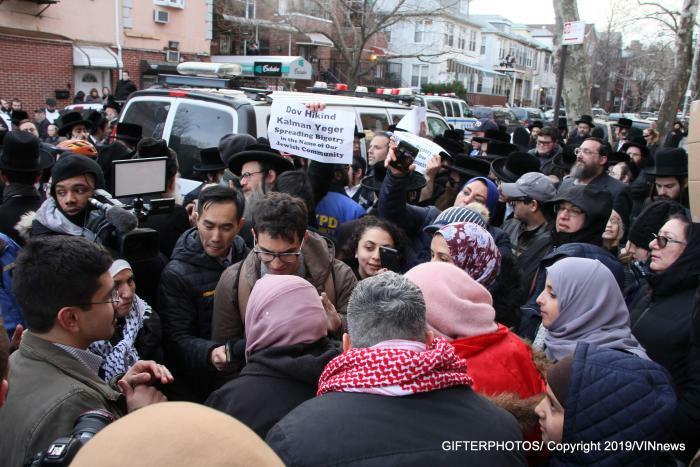 As previously reported on VIN News (http://bit.ly/2TI8DPF) a demonstration last night in Borough Park outside Yeger’s office to protest his remarks had a large Jewish contingent shouting down a handful of Palestinian demonstrators, with a significant NYPD presence in place to ensure that the rally stayed peaceful. Kalman Stay strong. We stand with you! Don't listen to the fake WNYC and Brian Leherer. If I know Kalman, and I do, he will stick to his original true words. Don't apologize for saying it like it is. deBlassio should resign for doing the worst job as Mayor. Woe! Did Yeger drag us down. What is he waiting for? We live here surrounded with millions if Muslims. Peaceful and not. Does he want blood on his fingers and only then will he apologize???? All he has to do is convince the Palestinians that they are not in fact Palestinians. That will clear everything right up. Kalman this isn’t strength. This is called being a blockhead. Apologize for your idiotic tweet and swear never to do it again. Focus on Cleaninig up the streets of your district. Given how the Omar anti-semitism issue was settled in Congress, this could be solved by a resolution calling for respect for all people and dropping the matter. there are no palestinian people as palestine has never existed they are just arabs who lived in an area that didn't become jordan. Ok no problem! You got it sir! But then they are Israeli.. you alt-yidden don’t get it. Feh. Maybe they are all actually Ottoman, or Trans-Jordanian??? But in truth, the Pelishtim were a thorn in Israels side since the Bnei Yisroel conquered Canaan. They will always be a problem until Gog Umagog. if the arabs only want a one state solution theirs!! Since when is acknowledging the fact that Palestine and Palestinians exist either a political position or a position on the legitimacy of anyone's policies? Yes, and there's no United States...just white and other folk who live in areas that were Indian and didn't become Canada! Yegers comments are fine , no need to apologize for his opinion and that of his constituents . He should resign when "Pencil Neck" Congressman Schiff resigns. He should demand that DeBlasio show him a copy of the founding papers of this alleged country called Palestine. He should demand to be shown some of their currency. He should demand to see copies of their ancient laws. He should demand to know who their founding fathers were. And on and on and on. This is the chance to bring this falsehood into the open. Woe! U have broad shoulders! How dare you suggest that? If G d forbid any Muslim animal acts upon Yagers words, u have blood on ur hands too! What a coward u are! I detest you and voted against you. I still do not consider you appropriate for political office. And I will not vote for you if you run for office again. But I am one of your constituents, and you do represent me on City Council. Do not apologize. You were absolutely correct. Palestinians exist, because they appropriated that label for themselves. If you chose to call yourself superman or spiderman, I might laugh, but you may do so. But Palestine does not exist. The people who call themselves Palestinians exist, and want to confiscate Israel to claim it as theirs. They do not want a two state solution. Just ask them. They want all Jews murdered, whether in Israel or elsewhere. They want the land for themselves, denying all of factual history. They are only bloodthirsty savages, subhuman at that, and are incapable of managing a sovereign country altogether. Look at the shambles of Gaza. Look at the mess of the west bank, only a bit better than Gaza because of Israeli support. They are not tolerant of peace, and their presence in America is only to push their agenda for world takeover by Islam. That's what they preach in Arabic. he should just apologize the same way Omar yemach shemoh did, half hearted meaningless.... just tweet something like: "de blasio told me to apologize so here you go, i'm sorry, i said it"
silly analogy. We are not animals walking around killing everyone we don't like. When did Omar apologize? Or better yet brad Lander buddy sarsour? De Blasio is a shmegegge who doesn't really care. He is a grubah goy who needs a serious misah m'shina together with sassour and the other yishmaelim. Yager should apologize with one of those long winded "Im sorry but you are still a jerk" apologies. Hey, hashomer, hows that collusion thing working for ya??? Lol!!!!! “ He should resign when "Pencil Neck" Congressman Schiff resigns. You’re the coward! Attitudes like yours, you coward, lead to holocausts! Strength only! Never again! When Omar, AOC and the third drekk apologise maybe you will too, until then, 'ah nechtigen tog' ! Woe! What hateful rhetoric in such volatile times. U defntly have no Jew in mind but ur selfish self as u so proudly admit it. Dont detest a jew but call him out for his ignorance that could have terrible repercussions. We are not here to determine if the Muslims can or can’t have a government. We are here to peacefully demonstrate that a Jew does is not a racist as Kalman so badly demonstrated. How unfortunate are ur words. Detestable! I agree. But that has nothing with Yegers despicable tweet. He shld resign not because his words or true or not. That ul debate in ur Shul. He should apologize and resign cuz of the tremendous chilul Hashem he made with his rediculous tweet and a Yid shld not suffer from the repression of it. He is an egomaniac that serves his own intrests and doesn’t give a hoot about the well being of Jews. So ur comparing Yeger to Omar? Nice! Is there a difference between a Jew and a Muslim? I guess by you there isnt. Yes were in Galus and need to be careful for OUR benefit. I know 2 oxymorons now. Feel good! Let's condemn all forms of hate. That should solve all the issues, just ask Omar. The analogy to Omar is correct and just as we rightfully expect an apology from Omar we should expect no less from Yeger. Brooklyn has a large Jewish and Muslim poulation that has gotten along peacefully with each other for decades. We should shun rabble rousing politicians who use twitter and the like to rile up passions and create tension for no constructive purpose. We dont need NY councilman mimicking the race baiting hate of our commander in chief. They were elected to do a job not ferment anger. They should stick to the work that they were elected to do. “ The analogy to Omar is correct and just as we rightfully expect an apology from Omar we should expect no less from Yeger. Really? I guess " for a decade without the "s". “ Woe! What hateful rhetoric in such volatile times. U defntly have no Jew in mind but ur selfish self as u so proudly admit it. What do you know about Yeger. I do, and it is incongruent with political office. Can you report on anything useful that was accomplished since he got into City Council? I would grant him several months time to get used to the new environment and to the political process. But he has been there quite some time. Any movement on any campaign promises? Lastly, he did not say anything negative about "Palestinians". He noted that "Palestine" does not exist, and he is correct. It also can't exist, which you also know. His statement was not racist. Oh, by the way, what was selfish about my comment? If yeger can vote against Ruben Diaz in the name of pc, why should we care what happens to him?